Suffolk has a great number of gardens that are special. Special to their owners and to many people who just love gardening and gardening history. One even more special aspect of the county´s gardens is the number of walled gardens there are. Some of these are in very fine condition and a fair number are being lost to decay, so a number of years ago, the Suffolk Gardens Trust set about forming a group of knowledgeable enthusiasts who all felt the same way about ensuring that these special gardens were recorded for future generations. Since the group has been established, over forty walled gardens have been recorded, and thanks to the great efforts of the group the details have been saved for posterity within the trust´s library. We meet up throughout the winter on Saturday afternoons for field trips to explore and record, armed with OS First series maps, and a range of useful tools to allow us to carry out basic excavations to establish essential details of the garden’s construction and also to generate accurate measurements. This is followed up with visits to the Suffolk Record Office to complete the research, which is then written up and turned into documents for future researchers and historians. Why only winter afternoons visits? Many of the more spectacular ruins would be impassable during the nettle growing season! We are always happy to welcome new members, our days out are fun, but we could do with more people happy to follow up in the Record Office and to try their hand at writing reports with help and encouragement from the group. 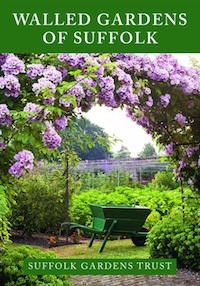 The Walled Gardens of Suffolk Book has sold very well. Copies have gone to Scandinavia and the USA, and recently Suffolk Libraries ordered 5 copies: praise indeed! It is stocked at various bookshops round the County. The final visit of the season is 2nd February 2019" The Grove, Frostenden, near Beccles. This is the home of one of our most recent members and has the potential of being an unusual garden to record. It survived a bomb dropped on the site during World War 11, which is a first walled garden visit to see that piece of history attached to it. If any Suffolk Gardens Trust members would like to join the group they are more than welcome. The visits are fascinating and often find details of the gardens that are unknown to the owners of the property. All enquires should be made directly to the chairman of the group, Peter Cunard by email:pcunard@globalnet.co.uk.